I want to preface this post by encouraging you to be open-minded, even if you think you absolutely cannot run. At 253 pounds, I never, in my wildest dreams, could have imagined I would one day run one mile, let alone a whole marathon. Yes, there are people who have health conditions or ailments that prevent them from running, and of course you should listen to your doctor; but, if you have the doctor's go-ahead, then I believe that just about anyone can run a mile. This past summer, I was asked to write a "Run Your First Mile" plan for From Fat to Finish Line (the company that produced the documentary I was in). My teammate Rik had already written a plan for them, but considering the people who will be using it, I thought it would be a good idea to have a second plan option that is different from what they may have tried before. Rik's plan follows the standard "walk-run-walk-run" intervals, which is what most beginner plans do; as I've mentioned several times on my blog, I despised doing intervals when I was learning to run. The main reason I didn't like running intervals was because I was always dreading the next running portion. I lived for the moments where I got a quick walk break; and then it was back to huffing and puffing during the run parts. Also, intervals are HARD. I had zero confidence in my ability when I was feeling like death after the first interval. I started thinking, "Why do I have to do intervals at all? Why can't I just get all the run portions out of the way in the very beginning, and then I can walk the rest of the time?" And so my own plan was born--and this was back in 2010, before I knew anything at all about running. I began to do my own thing, and it worked much better for me. Since then, I've run dozens of races, tried several different training plans for various distances, obtained my RRCA running coach certification, and written numerous running plans for others, as well as myself. I still believe that my "Run Your First Mile" plan is a solid one, and a good option for people who may hate intervals like I did. From Fat to Finish Line ended up using Rik's plan for their needs, but Angela encouraged me to make mine available here in case someone decides intervals just aren't for them. This method is what got me started as a runner, as well as dozens of my readers who used the same method (using my Walk to Run plan). 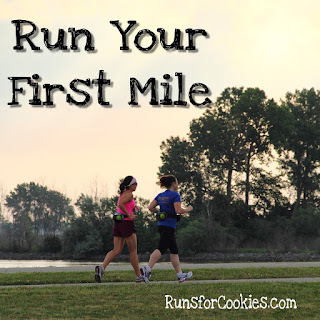 This "Run Your First Mile" is very similar to the Walk to Run plan, but the end target is to run your first mile rather than run for 30 minutes straight. The plan is great for anyone who is capable of walking 30 minutes, 3 times a week; and it will help you to run your first mile anywhere from about Week 5 to Week 8 (depending on your pace). The number one thing I want anyone to remember when starting to run is this: If it feels too hard, SLOW DOWN. It sounds so simple, and it is--just by slowing your running pace down to the slowest you can possibly run (a slow shuffle is just fine! ), you'll be amazed at how much farther you can make yourself go. My brother gave me this advice when I started out, and to this day, it's the best advice I've received about running. Cotton gets very heavy when it gets wet (from sweat, rain, etc). I would definitely recommend getting some moisture-wicking clothing. It doesn't have to be expensive, either! Some of my favorite running clothes actually came from Wal-Mart and cost about $10. Invest in your running shoes. Even for those just beginning, I strongly encourage you to go get fitted for running shoes at a proper running store. These likely will be expensive, but they will last you for about 400 miles of running. And good shoes can prevent injury, make running more enjoyable, and make you feel less sore. It's okay to stop during run--to take a drink, answer an important phone call, chat with a friend you bumped into, pick up a quarter, or anything else. When I first started running, I thought it "didn't count" if I stopped at all, even at a stop light. That's silly! Runners stop all the time for various reasons. Just keep it brief and keep going. It still counts. Likewise, you can still say you "ran a half-marathon" (or whatever distance) if you walked through the water stations. Believe it or not, this is one of the most common questions I am asked. If a friend offers to run with you, don't fear that you are "holding them back" because your pace is slower. Chances are, you friend already knows you're not out to qualify for Boston as you prepare to run your first mile; and they wouldn't have offered to run with you if they didn't want to. I always enjoy running with people who are slower than I am, because it's fun to chat and it makes the time go by fast. If I have speed work or something that must be done, then I just choose a different day to run with a partner. My friend and I ran a 10K together and then decided to do a half marathon. When we began training, we decided to do the Galloway method, as it made running long distances seem more doable. We opted for the "run on minute, walk 30 seconds." This worked great for my friend. It was misery for me. I never felt like I found my groove. It was a struggle. It slowed me down. We bickered over pace the whole time and it took all the joy out of running for me. My friend has run several half marathons since, and still runs the same intervals. I quit running, as I figured "i'm not a runner." Now I wonder if I should get back out there and ditch intervals and just run. Thanks for this post!! Thank you for this. I looked at your running plan and I am happy to say that I am now running 11 minutes. I remembered what you said - slow down. Sometimes I feel that I can walk as fast as I run, but I read you said that too. I am going to make it to the 30 minutes then improve my pace. Thanks for sharing this - it has really helped. I have been training at strictly MAF for over six months that now. I have good sleep and eating habits, not much stress in my life. I am currently running 30 miles a week all at MAF and because of my work schedule I train primarily on a home treadmill. Recently I have had some interesting runs and thought maybe you could shed some light on what might be happening. My MAF is 145 and I start all runs with a brief five minutes warm-up at 125-135 bpm which generally puts me at 11:30 per mile. I then run my distance for the day at 135-145 and then end with a cool down similar to the warm-up. Usually always cardiac drift sets in and within mile 1 or 2, I have already reached MAF and running slower than my warm-up pace. However, during today's run, I kept the pace at 11:30 and ran my six miles at an average of 130 bpm with the high being 135. I felt good and energized. But I am stumped as to why I was able to keep my heart rate so low todsy and why I am not able to all the time. Does this ever happen to you? This is great, Katie, thanks for sharing! I am hoping this is one plan that will get my partner into running, ever so gently, come spring (he won't exercise outside if it's colder than 50!). In nicer weather we play a lot of tennis and go on walks and hikes together, so maybe this will do it for running! Your post was just what I needed to jog instead of walk the whole time on the treadmill this morning. Thank you! Great tips. Very encouraging! I also never thought I could be a runner but a few years ago I took a similar slow method to go from running just 30 seconds at a time to running my first 10K in just a few months. I haven't run in a long time because I'm pregnant (and had complications early on, which meant no running), but I'm looking forward to starting again after baby comes. I am a living example of Katie's running plan. I'm 60 years old and had only run 1 mile one time in my life. RUN SLOW!! I can tell you how much this piece of advice helped me. NO INTERVALS!! When I tried interval training, it just seem so hard. I tried Katie's method, just run and then walk for 30 minutes, and then keep increasing the run time. I started October 1st and now my longest run is 50 minutes at a 13:20 pace, still slow but I started at a 14:30 pace so I happy with my improvement. I'm training for a 10k now and even through Katie's "Your Best 10K plan" is still too advanced for me, I'm adapting it to meet my goal. Thanks Katie, you have no idea how much you have helped me. I love this! I completely agree with the last point - if a friend offers to run with you, they are willing to run your pace, no shame! My BFF is a much faster runner than I am, but just enjoys the company sometimes even though she definitely knows what she is getting into! Katie, you were my number 1 resource and motivator when I started running. I would read your blog and cry at the thought that I could be a runner. I remember your story about the first time you ran 8 miles and I thought I could never run that far. But I did and it stands out as one of my very best runs. Thank you for all that you share. You really are making a difference.